Potted lilies have become increasingly popular for celebrating spring holidays. But these days the traditional white Easter lilies have had to make room for a beautiful array of pink, orange, yellow, rose and red-toned varieties that have come onto the scene. Whether bought for decoration or to give as a gift, lilies long-lasting beauty and fragrance are especially appreciated in the early months of spring when everyone is ready to close the door on winter. Whatever type of potted lily you bring home, or receive as a gift, you’re sure to fall in love with its showy blossoms and lush foliage. It's for that reason that many home gardeners want to find a way to transplant their potted lilies outside once the blooms have faded. And there's no reason you shouldn't. Most lilies - if the transition to life in the garden is handled with care - will thrive and produce many more seasons of beautiful flowers outdoors. The first thing to remember when transplanting your potted lily, is that the greenhouses that produced it forced the blooms to come early. Most outdoor lilies will blossom in the summer, the Asiatic varieties in early summer and the Oriental varieties after the Asiatic types have faded. Planting both types of lilies in the same area is a great strategy for enjoying a continuous display over a longer period. You should not expect your potted lily to flower again the summer you replant it in the garden. In fact, it may take a couple of years before it grows strong enough to flower outside. But be patient and you will be rewarded in time. Enjoy your potted lily indoors until all danger of frost has passed. Keep it in a cool place with partial sun, snipping off the flowers once they fade. A week or so before you are ready to put the lily in the garden, start letting it sit outside for longer periods each day. This is called "hardening off," a necessary step for plants that have lived their entire lives in the warmth of greenhouses and living rooms. The soil in the flower bed should be rich with organic compost. Add compost if needed. Plant the lily to the depth it was in its pot, and add a layer of mulch to keep the soil cool. Soon the original stem and leaves will start to brown--don't panic. Prune the plant to where it is still a healthy green. New growth (but no flowers) will emerge through the summer. When that yellows and wilts in the fall, trim the plant back to the ground and cover with a few inches of mulch for the winter. When the weather warms the next spring, push back the mulch to let the lily grow, applying a balanced fertilizer once a month until the summer blooms begin. Planting your potted lily plants into the garden is sure to bring you joy for years to come. Butterflies and other beneficial pollinators that are attracted to lilies will thank you for it too! 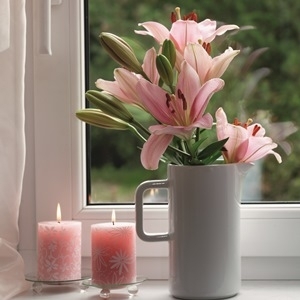 Lilies are beautiful and long-lasting in a vase. Cut flowers only from mature, well-established plants. Pro Tip – If you are sensitive to pollen you can remove the pollen-producing anthers from the flowers. Using a tissue, pluck the anthers off and dispose of them. Take care not to get the pollen on fabrics; it can leave a yellow stain. How to care for potted flowering bulb plants after the flowers fade.